Bank Internal Audit: A Working Guide to Regulatory Compliance keeps banks in line with internal audit demands with sample procedures, checklists, and guidelines. Uncover Lapses in Your Policies and Procedures Before the Examiners Do. Management and the board of directors spend a lot of time and effort to develop and implement policies and procedures to keep your bank out of trouble and maintain profitability. But if those policies and procedures aren't enforced, you've wasted your time, and the bank could be at risk. That's why the regulators are demanding internal organizational audits, and why we give you the guidelines for an audit process that works. 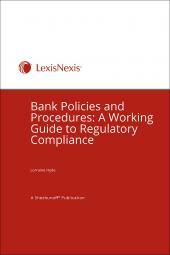 Bank Internal Audit: A Working Guide to Regulatory Compliance shows you how to make sure your policies and procedures are being followed. Plus, you get: sample procedures for every key area of the bank, checklists, examples of documentation, and clear guidelines you can use for your own internal audit of your operation. Periodic updates keep your audit function current with the latest compliance issues, so you can help get your bank in line and make sure it stays that way, easily and effectively. Make Sure Your Organization Is Following Your Rules. You make the rules. Now make sure they're being followed the way you intended. Unlike financial audits, an organizational audit will involve everyone in the bank at some level. 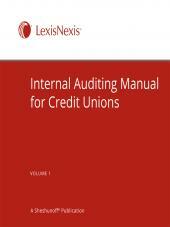 This Bank Internal Audit manual shows you how to establish audit job descriptions, implement audit reporting systems that give you useful information without disrupting critical workflow, and ensure that the internal auditor remains independent. The manual shows you how to determine who should be made responsible for specific tasks, what your board of directors needs and how to give it to them, and how to prepare informative reports for management. Sample internal audit procedures are provided for each key area that you can easily adapt to your bank's specific requirements. and/or failed banks and the absence of sound internal audit policies, procedures and controls. Appendix C: OCC, Comptroller’s Handbook of Internal and External Audits, April 2003. 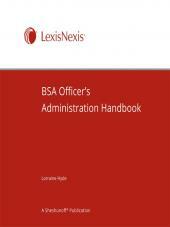 This handbook can be used as a checklist for evaluating internal and external audit policies. Appendix D: OCC, Comptroller’s Handbook for National Bank Examiners, September 2007. Appendix E: OCC bulletin 2003-12, Re: Interagency Policy Statement on Internal Audit and Internal Outsourcing: Revised guidance, March 17, 2003. Appendix F: FFIEC Information Technology (IT) Handbook, Audit Booklet, April 2003. Appendix G: FDIC FIL-33-2009, Final Amendment to Part 363, June 23, 2009.